Master social media to take your job search strategy to a whole new level!
" The savvy job seeker is the one who takes their time to learn how to best use these social media resources, now and throughout their career." MBA, Social Media Expert, Speaker and Author. 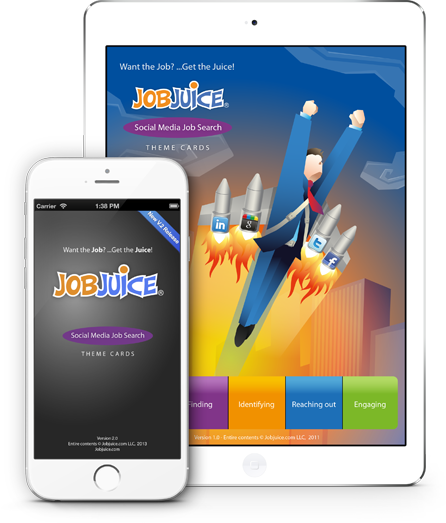 The Jobjuice Social Media Job Search App is a key tool for the modern job seeker. With over 100 cards, the app uses cross-referencing to reinforce the links between Personal Branding, the FIRE job search methodology and the social media tools you will need to land your next job. Access over 100 cards packed with key information to help you build a powerful personal brand, identify job opportunities and engage potential employers using the internet. Learn how to use key Social Media tools to boost your job search and build a strong professional network. Identify employer’s needs using social media to understand your target companies and industries. Learn how to reach out and engage with professional networks and potential employers online using the right etiquette. Learn how to use Facebook, Twitter and Linkedin to find your next job. Easily navigate through deck with built in links and cross-referencing. Search key topics with built in search engine. Use the “quick reference” format to easily browse through topics and create your own groups of cards by topic or interview question. Use the practice section to flip through random cards to test your memory. Review your job search strategy on the bus, in a meeting, at lunch…anywhere, anytime. Personal Branding. Provides you with all the information you need to help you build a powerful and relevant personal brand based on the needs of your target companies and industries. Finding. Presents a variety of tools to build a highly targeted list of companies and find key people and hiring managers to proactively search for a job. Identifying Needs. Provides resources for your job market research and offers great tips on using social media to really understand the industry, companies and people. Reaching Out. Lays out the steps to getting to an informational interview using social media to find interview sources. Engaging. Shows you how to use social media to contact hiring managers, handle objections and rejections and provides valuable insight on how to make the best of the interview. Master the Social Media Platforms to take your Job Search Strategy to the next level! LinkedIn. Walks you through LinkedIn’s main functions, shows you the best ways to convey a solid brand that stands out and how to maximize you LinkedIn network for your job search. Twitter. Teaches you how to use Twitter to help you identify potential job opportunities and connect with valuable people to your job search. Facebook. Takes you beyond Facebook basics to teach you how to keep your profile professional use the right privacy tools and use this platform to find your next job!